Walkner Condon Financial Advisors provide custom investment solutions for our clients. We will help you identify what portfolio series best fit your financial objectives and risk tolerance. While many advisors are inflexible with inherent biases towards passive or active management, we believe strongly in offering choice in investment strategy. 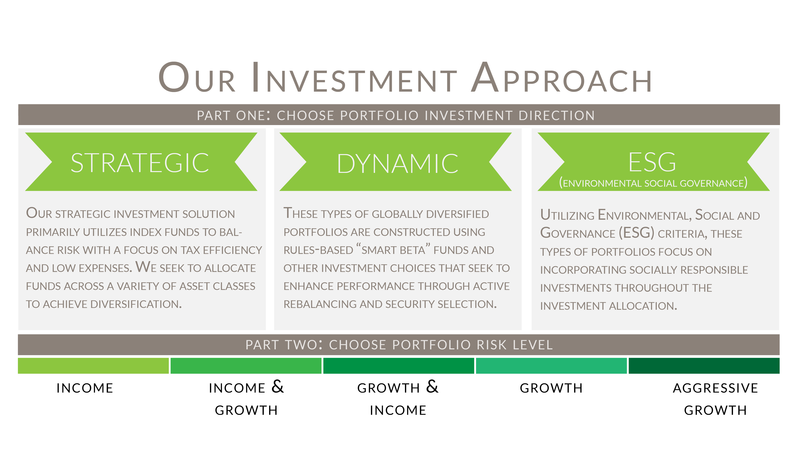 We also offer portfolios that seek to align investment objectives with client values. We believe that the bulk of client’s portfolios should be invested in a globally diversified manner and that clients benefit from a “buy and hold” approach rather than one that attempts to time the markets. We seek to utilize funds that are low in cost relative to their peers and categories and are generally tax efficient, though there are times where consider funds that are higher in cost or turnover do make sense from an allocation standpoint. We offer our clients choice in their asset management strategy and are not absolute in our views in the debate between active and passive management.